Composite decking is a synthetic blend of recycled plastic and wood. In the past decade or so composite decking has really taken off. This popularity was mainly due to the term "maintenance free" coined by the industry. Some of the major composite decking companies like Trex, Timber Tech, and Azek claimed that the composite decking material did not need to be cleaned or sealed like wood decking. 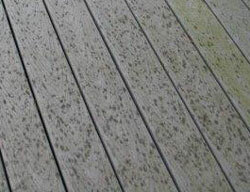 Over the years many of the composite decking companies found themselves in class action lawsuits with deck owners because the composite material was prone to water damage, fading, and mild/mildew and in fact did need to be maintained. Since then the industry has changed the term to "low maintenance." The bottom line is there is no horizontal exterior surface that does not need to be cleaned and/or sealed on a regular basis to enhance appearance and maintain longevity. When mold and mildew starts to become noticeable on your composite deck it is important to clean it properly. The sooner you clean it the better because if the spores stay embedded for long enough they can be nearly impossible to completely remove. Clean the composite material deck with a percarbonate wood cleaner to remove all the unwanted soils. Sealing a composite deck will also help restore color and aid in the cleaning process the next time the composite wood decking needs maintenance. Most of the composite decking sealers apply easily with a pump sprayer and are user friendly. Composite decking maintenance is crucial to the appearance and life of the decking. Regularly cleaning and sealing a composite wood deck will give your family a safe and clean outdoor area and will ensure many years of use. I want to use Trex to form hollow box/benches having sides which are perpendicular to my Trex deck. Is there a product to fill the gap between the Trex planks which form the sides of the banch/boxes? We do not sell any stains that work with composite wood like Trex. Would an oil based clear sealer work on a 1st generation Trex deck? I have power washed it for years so it is clean but would like to protect it from mold and mildew further. Do you sell oil based or only synthetics and which would work best? No, a clear oil-based sealer will not work. Best to use the Defy Composite sealer. My trex decking is 4 yrs old. It is trex select. It is under a covered patio. The colors are saddle brown with burgundy edges(can’t remember what they called the color ) my problem is it gets very dirty, because of our dog and we live in the country so not a lot of grass. But the colors are VERY dull. I love the way it looks when it’s wet. Is there anything you can do to make it look wet all the time? A sealer or something? It’s very hard to keep clean so I thought if there’s a sealer that is safe for text decking it would solve both problems. Sorry but no, there is not a sealer that will enhance the Trex as if wet with water. Is there anything I can do to make it easier to keep clean? Scrubbing it weekly isn’t an option. Thank you for the recommendation of a cleaner. If I put your sealer on it would that help to keep it clean also? It will help to reduce the mildew. I have stained some composite decking. now I need to know what is the best sealer would be? Hello, you cannot apply a sealer over a deck stain. All your tips on sealing composite decking seem to be referring to floor decking boards. My problem is railings and spindles, not the floor. I can't imagine how long it would take to apply a sealer to the railings around our deck in the way you suggest. But after numerous scrubbings and cleanings, the finish is much more porous than when it was first installed. It is 10 years old. Any suggestions? You can spray on the sealer with a pump sprayer. It is easy. We have sealers that will seal, but there is not a composite dealer that darkens the color. Do you (Sealer Store) have a stain/sealer product specifically "designed" to restore faded color and seal composite decking? Does the sealers darken the decking material any?